70-kDa Heat shock proteins are ATP-driven molecular chaperones that perform a myriad of essential cellular tasks. Although structural and biochemical studies have shed some light on their functional mechanism, the fundamental issue of the role of energy consumption, due to ATP-hydrolysis, has remained unaddressed. Here we establish a clear connection between the non-equilibrium nature of Hsp70, due to ATP hydrolysis, and the determining feature of its function, namely its high affinity for its substrates. Energy consumption can indeed decrease the dissociation constant of the chaperone-substrate complex by several orders of magnitude with respect to an equilibrium scenario. We find that the biochemical requirements for observing such ultra-affinity coincide with the physiological conditions in the cell. Our results rationalize several experimental observations and pave the way for further analysis of non-equilibrium effects underlying chaperone functions. Proteins perform numerous essential tasks in cells. Most of these tasks require the protein to have a very specific structure, which is maintained by a balance of chemical and physical interactions. However, this delicate balance is vulnerable to excessive heat, changes in the pH of the cell, and certain chemicals. As a consequence, proteins could lose their specific structure and stop working. Cells employ a group of specialized proteins—called chaperones—to check that other proteins have the correct structure, and to ‘refold’ those that do not. The Hsp70 chaperone family needs energy to do its job, and it gets this energy from a molecule called ATP. However, the exact way that Hsp70s work and use this energy is not fully understood. One major puzzle is how Hsp70 binds to a protein to fold it up. Previous experiments suggested that this binding is particularly effective if Hsp70 can adopt different structures as part of a complex cycle governed by ATP. Now, De Los Rios and Barducci reveal that the energy released from breaking down ATP molecules enables this extra-efficient binding to occur. According to the proposed model, this is possible under some conditions that are normally found in cells. These include having many more Hsp70 proteins than target proteins, and producing energy at extremely high rates from ATP. The specific kinetic properties of the different structures Hsp70 can form are also crucial. More generally, the principle that energy consumption enhances binding could be extended beyond chaperone proteins and represent a general mechanism for other biomolecular systems. ATP-driven molecular chaperones play a central role in protecting cells against proteins that could unfold or misfold because of mutations, various stresses or fluctuations and ultimately result in cytotoxic aggregates (Bukau et al., 2006; Hartl et al., 2011). 70-kDa Heat shock proteins (Hsp70s) stand out for several reasons: they are possibly the most ubiquitous, they function as monomers, and they supervise a plethora of diverse cellular processes (Mayer and Bukau, 2005; Zuiderweg et al., 2013) such as protein translation (Kramer et al., 2009), protein trafficking (Matlack et al., 1999; Neupert and Brunner, 2002), the disassembly of protein complexes (Böcking et al., 2011), signaling (Pratt and Toft, 2003) and protein degradation (Hohfeld et al., 2001). All these tasks crucially depend on the high-affinity binding of Hsp70s to substrate proteins during a complex ATP-driven conformational cycle (Mayer, 2013). The ATP- and ADP-bound states of Hsp70 (Hsp70⋅ATP and Hsp70⋅ADP respectively) and their interconversion play a major role in the chaperone functional cycle: the nature of the bound nucleotide affects the affinity of the chaperone for its substrates, with Hsp70⋅ADP binding the substrate more stably than Hsp70⋅ATP (Schmid et al., 1994; Theyssen et al., 1996; Packschies et al., 1997; Gisler et al., 1998; Russell et al., 1998; Laufen et al., 1999; Mayer et al., 2000). Intriguingly, several experimental evidences suggested that the effective affinity of Hsp70 for substrates when the chaperone was running through its ATP-hydrolysis driven cycle was significantly higher than both the ones of Hsp70⋅ATP and Hsp70⋅ADP (Laufen et al., 1999; Wittung-Stafshede et al., 2003). Because this remarkable result would not be possible within the boundaries of thermodynamic equilibrium, it is therefore necessary to clarify how ATP hydrolysis, and thus energy consumption, can affect the binding strength of Hsp70s to their substrates. According to the consensus Hsp70 cycle (Figure 1) substrate binding/unbinding takes place with rates that depend on the state of the bound nucleotide (kATPon, kATPoff, kADPon, kADPoff) (Schmid et al., 1994; Gisler et al., 1998; Mayer et al., 2000), with Hsp70⋅ATP exchanging the substrate two to three orders of magnitude faster than Hsp70⋅ADP. The conversion from Hsp70⋅ADP to Hsp70⋅ATP occurs through a nucleotide exchange process which is described here at an effective level as a simple first-order reaction with rate kDT, or kDTS in the presence of a bound substrate (Figure 1, and ‘Materials and methods’ for a full derivation). The conversion from Hsp70⋅ATP to Hsp70⋅ADP can occur by means of two different processes: nucleotide exchange (dashed arrows in Figure 1, with rate kTDex, and kTDex,S in the presence of the substrate) and ATP hydrolysis (red arrows in Figure 1), whose rate depends on the absence or presence of a bound substrate (kh and khS respectively). The total conversion rate from Hsp70⋅ATP to Hsp70⋅ADP is thus kTD=kTDex+kh (and analogous expressions in the presence of a substrate). In the cell, several cochaperones tune the exchange and hydrolysis rates: J-domain proteins (JDPs) enhance the rate of ATP hydrolysis, and nucleotide exchange factors (NEFs) catalyze nucleotide release (Youker and Brodsky, 2007; Kampinga and Craig, 2010). Within the present description, cochaperones are not taken into account explicitely. Rather, their action is captured as a modulation of the cycle timescales. In particular, JDPs are known to bind the substrate and subsequently interact with Hsp70, enhancing ATP hydrolysis. Consequently here only the hydrolysis rate in the presence of the substrate, khS, is affected by the action of JDPs. The model takes into account four states in Hsp70 (NBD is schematically represented here in green, SBD in orange), which are defined by substrate binding and by the nature of the bound nucleotide (ADP or ATP). The rates of the substrate binding/unbinding process (horizontal blue lines) are influenced by the nucleotide (kATPon, kATPoff, kATPon, kATPoff). ADP-bound states are converted to ATP-bound states through a nucleotide exchange process (vertical solid blue lines) with rates kDT , kDTS. The ATP to ADP conversion can occur by means of either a nucleotide exchange process (dashed blue lines) with rates kTDex, kTDex,S or ATP-hydrolysis (red lines) with rates kh, khS. A significant difference between hydrolysis and nucleotide exchange must be outlined here: ATP-hydrolysis, at variance with exchange, results into a net production of ADP and a loss of ATP. In a cellular perspective, the ATP and ADP concentrations are kept fixed by energy-consuming chemostats. In vivo, ATP hydrolysis is therefore an intrinsically non-equilibrium process. Because we aim here at elucidating the relation between energy consumption and substrate affinity, we determine the effective dissociation constant of the system, Keff, which provides a coarse-grained measure of how well Hsp70s can bind their substrates through their cycle. Keff is defined in the usual way as Keff = [S][Hsp70]/[Hsp70⋅S], where [Hsp70] is the total concentration of Hsp70 not bound to a substrate ([Hsp70] = [Hsp70⋅ATP]+[Hsp70⋅ADP]), [Hsp70⋅S] is the total concentration of substrate-bound chaperone ([Hsp70⋅S] = [Hsp70⋅ATP⋅S]+[Hsp70⋅ADP⋅S]) and [S] is the concentration of free substrate. where KD(ATP) and KD(ADP) are the dissociation constants of the Hsp70⋅ATP-substrate and Hsp70⋅ADP-substrate complexes, respectively. Not surprisingly, Keffeq corresponds to a weighted average of KD(ATP) and KD(ADP), and it cannot be lower than KD(ADP), usually the lowest of the two (Schmid et al., 1994; Gisler et al., 1998; Mayer et al., 2000). As a matter of fact, in vivo Keffeq would be close to its typical upper bound, namely KD(ATP), because of the cellular excess of ATP over ADP. The equilibrium dissociation constant can be in principle measured in experiments where Hsp70 hydrolysis deficient mutants are used (McCarty and Walker, 1991), at varying ratios of the concentrations of the two nucleotides. At variance with equilibrium, when ATP hydrolysis is turned on, the energy budget along the cycle is not restricted to the free-energy differences between the different states. Rather, the dissipated energy Ediss, which is related to ATP hydrolysis, must be taken into account. Thus detailed balance is broken and pairwise reactions cannot be solved individually as in the equilibrium case. Nonetheless, even in non-equilibrium conditions a steady-state solution of the cycle exists (‘Materials and methods’), and it provides an expression for the non-equilibrium dissociation constant (Keffneq). 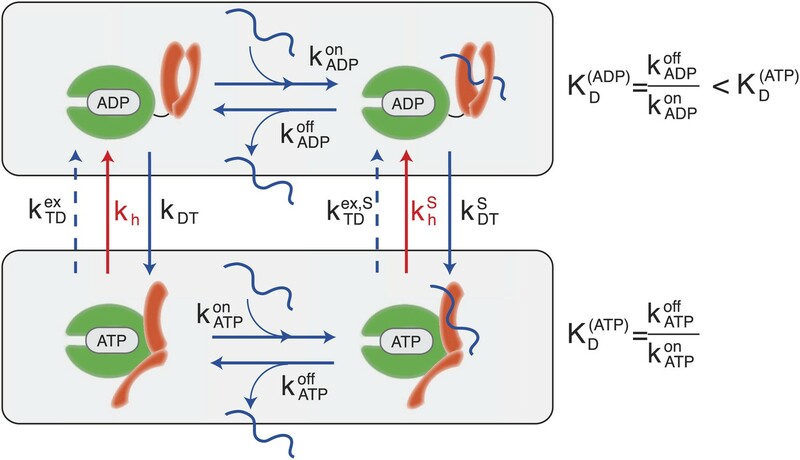 In this scenario, ATP hydrolysis is controlled by the fixed basal hydrolsysis rate kh and the substrate-enhanced rate khS, which is further modulated in cellular conditions by JDP co-chaperones. The ratio khS/kh, that measures the hydrolysis acceleration, is thus a natural parameter to characterize the behavior of the system. as a function of khS/kh. Here we consider the experimentally determined parameters for the Escherichia coli DnaK-DnaJ system (see Table 1), and concentrations that roughly mimic cellular conditions ([Hsp70]tot = 40 μM and substoichiometric substrate, here [S]tot = 4 μM). Not surprisingly, the hydrolysis flux increases with khS/kh, before saturation, corresponding to a regime dominated by the rate-limiting exchange process (Gassler et al., 2001). Effect of ATP-hydrolysis on Keffneq. Total energy consumption (A) and effective non-equilibrium dissociation constant of the Hsp70-substrate complex (B) is plotted as a function of the hydrolysis acceleration ratio khs/kh, for the DnaK/DnaJ/substrate system with concentrations [Hsp70]tot = 40 μM and [S]tot = 4 μM (see ‘Materials and methods’ for the parameters), The approximate dissociation constant Keff,0neq is also plotted for comparison (black dashed line). The green region comprised between KD(ATP) and KD(ADP) corresponds to the range of affinities accessible at equilibrium (no hydrolysis). The red-to-yellow region corresponds to the values of the dissociation constants that are exclusively accessible to the non-equilibrium regime. The region where red fades to yellow (103 ≤ khs/kh ≤ 104) corresponds to the transition from physiological to non-physiological values of hydrolysis acceleration. This corresponds to the reaction Hsp70⋅ATP⋅DnaJ2⋅S → Hsp70⋅ADP⋅DnaJ2⋅S. In Figure 2B we report Keffneq, as a function of the acceleration ratio khS/kh. As khS/kh increases and more energy is consumed, Keffneq decreases, until it becomes lower than KD(ADP) by several orders of magnitude. Non-equilibrium conditions lead thus to a dramatic increase of the affinity of Hsp70s for their substrates, that could not be achieved at equilibrium, where the effective dissociation constant would be bounded between the ones of the ATP-bound and ADP-bound states. We dub such effect ultra-affinity in analogy with energy-consuming ultrasensitivity observed in many enzymatic systems (Goldbeter and Koshland, 1981). The lower bound of the non-equilibrium dissociation constant is Keffneq=kADPoff/kATPon, which can be achieved for extremely high values of khS/kh (Figure 2B). This regime corresponds to the limiting case of substrate binding exclusively to Hsp70⋅ATP, which has the fastest binding rate, and being released exclusively from the ADP-bound state, which has the slowest unbinding rate. Our analysis indicates that this theoretical limit, recently hinted at (Zuiderweg et al., 2013), likely pertains to a regime that is not accessible to Hsp70s. which is reported in Figure 2B (dashed line) and provides a good approximation of the exact behavior in the physiologically-accessible range of khS/kh. Dependence of Keffneq on time-scale separation and on stoichiometric ratio. (A) Non-equilibrium dissociation constant as a function of the hydrolysis acceleration ratio khs/kh and of the time-scale separation between the ATP- and ADP-state, expressed as the ratio between the substrate unbinding rates between the ATP- and ADP-state. (B) Non-equilibrium dissociation constant as a function of the hydrolysis acceleration ratio khs/kh and of the stoichiometric ratio between the total substrate and Hsp70 concentrations. The color codes are the same as in Figure 2, green for the region accessible in equilibrium, and red-to-yellow for the region accessible in non-equilibrium. The blue line is the non-equilibrium dissociation constant reported in Figure 2B. Strikingly, ultra-affinity depends also on the concentration of the substrate as can be inferred from the explicit expression for Keffneq. This is another effect intrinsically tied to the non-equilibrium nature of the cycle. Indeed, at equilibrium, dissociation constants do not depend on the total species concentration since they simply encode the difference of free-energy between the bound and unbound states. We thus explore in Figure 3B the dependence of Keffneq on both khS/kh and the ratio between the total substrate and the total chaperone concentrations (for [Hsp70]tot = 40 μM). Two distinct regimes can be observed here with a sharp transition occuring at [S]tot/[Hsp70]tot = 1. In the excess of chaperone ([S]tot/[Hsp70]tot<1) we observe ultra-affinity and the previously described behavior, whereas in the excess of substrate ([S]tot/[Hsp70]tot>1) the gain in affinity as a function of khS/kh is limited and Keffneq never exceeds its equilibrium range. This effect can be easily rationalized considering that in the latter condition, substrate binding to ADP-bound state becomes dominant and the system cannot exploit the time-scale separation in binding/unbinding kinetics to achieve ultra-affinity. Quite surprisingly, the experimental characterization of the Hsp70-substrate dissociation constant in physiological, non-equilibrium conditions is extremely limited. However, ultra-affinity was implicitely suggested in a series of works assessing the binding of different substrates to Hsp70s, always in the presence of a co-localized JDP, thus ensuring maximal hydrolysis acceleration upon substrate binding (Misselwitz et al., 1998; Laufen et al., 1999; Sullivan et al., 2001). In all these assays the substrate was observed to bind more efficiently in the presence of ATP, that drives the chaperone through its cycle, than in the presence of ADP, that instead blocks the system in the Hsp70⋅ADP state, the one with the lowest thermodynamic dissociation constant. We know of only one case where ultra-affinity has been carefully measured for the Hsp70 system interacting with a substrate peptide fused to a J-domain (Wittung-Stafshede et al., 2003). The dissociation constant observed with this setup (≈0.22 nM) was two orders of magnitude smaller than both the measured KD(ATP) and KD(ADP) (≥30 nM). If we combine our model with the specific rates provided in (Wittung-Stafshede et al., 2003) and values of khS/kh compatible to what reported in the literature, we obtain a predicted Keffneq in the range 0.15–0.6 nM, which is in excellent agreement with the experimental value. All these findings strongly suggest that ultra-affinity becomes manifest when substrate binding is coupled with enhanced hydrolysis acceleration by the colocalization of the Hsp70 binding region and of a J-domain. Our analysis of the cycle has unveiled the conditions that Hsp70 must satisfy to exhibit ultra-affinity: (i) the substrate-exchange rates of the ADP-bound state must be significantly slower than the ATP-state so that extremely different timescales can be exploited; (ii) ATP hydrolysis must be enhanced by orders of magnitude to fully enter the ultra-affinity regime; (iii) the chaperone must be in excess over the substrate. All these conditions are typically met in the cell by canonical Hsp70 chaperones, such as bacterial DnaK and cytosolic Hsc70 in eukaryotes: Hsp70⋅ADP is known to have limited exchange kinetics; Hsp70s are known to work only in partnership with JDPs; Hsp70s are highly abundant and typically in excess over JDPs (Finka and Goloubinoff, 2013). Cellular conditions seem thus to be optimal for ultra-affinity. Our results provide an additional example of how ATP hydrolysis can be exploited by cells to overcome the constraints set by equilibrium thermodynamics. The key role of energy consumption in driving biochemical cycles for performing a variety of functions is well established (Schnakenberg 1976; Hill, 2005; Ge et al., 2012) and recently it has been recognized in cellular processes such as sensing, signaling and adaptation (Qian and Reluga, 2005; Lan et al., 2012; Mehta and Schwab, 2012). Notably, the ultra-affinity concept proposed here shares some similarities with the well-known kinetic proofreading (Hopfield, 1974) since in both cases chemical energy consumption is used to increase the binding affinity of specific molecules beyond their equilibrium value. However, a significant dissimilarity can be outlined: kinetic proofreading exploits multiple non-equilibrium steps to enhance a pre-existing difference in binding affinity among various substrates, whereas ultra-affinity is achieved due to the specific ability of the substrate to induce upon binding a non-equilibrium transition in the receptor (i.e., the chaperone). We expect that a similar approach may be applicable to more specialized Hsp70s, such as HscA (Hesterkamp and Bukau, 1998), and to other chaperones, with possibly more complex cycles, such as the GroEL/S system, Hsp100s and Hsp90s. As well, it would not be surprising to discover other molecular machines working along the same principles, so that the present study might also provide a general scheme applicable beyond Hsp70 chaperones. We frame here the model in terms of deterministic mass-balance equations, which describe the evolution of the concentrations of the different states. This treatment is appropriate for the Hsp70 system since both chaperones and substrates are highly abundant in standard cellular conditions. In the case of less abundant molecular species fluctuations might not be negligible. Therefore a more detailed, stochastic description of the process would be required (Ge et al., 2012). where kATP− and kADP− are the ATP and ADP release rates, respectively, and kATP+ and kADP+ are the ATP and ADP binding rates, respectively. and analogously for the equation for [Hsp70·ADP]. Typically the nucleotide release rates are much slower than the nucleotide binding rates (Table 1), and the above expressions correctly capture that nucleotide release sets upper bounds for the rates, which are then further modulated by the partitioning between ATP and ADP binding. Importantly, the equilibrium constant between the ATP-bound and ADP-bound states is correctly reproduced by the ratio kTDex/kDTex. Analogous expressions can be obtained for the exchange process in the presence of a bound substrate. The acceleration of hydrolysis by JDPs is described here as a modulation of khs in the range kh<khs<kh,maxS, where kh,maxS is the maximal experimentally determined JDP/substrate accelerated hydrolysis rate. In this work we extend our analysis also to larger values of khs for completeness. A more complete description of the underlying co-chaperone binding/unbinding reactions would only overburden the present model without providing further insights. The dimerization of DnaJ into DnaJ2 has also been considered as implicit. which holds for a cycle at thermodynamic equilibrium because the free energy difference accumulated over a cycle is ΔG = 0 (Ge et al., 2012). The upper bound for the hydrolysis acceleration induced by JDPs (kh,maxS) corresponds to the hydrolysis rate experimentally observed in saturation of DnaJ concomitant with the presence of the substrate (Laufen et al., 1999). The rate of synthesis of ATP from ADP (the microscopic reverse of hydrolysis) is neglected here because it was experimentally proven to be below the level of detectability even in the presence of the hydrolysis-accelerating JDP cochaperones (Russell et al., 1998), that is ksynth≤10−6 s−1. In all the calculations the chaperone concentration is 40 μM. The ratio [ATP]/[ADP] = 10 has been used throughout the calculations, approximately matching the physiological ratio. where [S]tot is the total substrate concentration. Nature Structural & Molecular Biology 18:295–301. Cell Stress & Chaperones 18:591–605. The Journal of Biological Chemistry 276:32538–32544. Physics Reports-Review Section Of Physics Letters 510:87–118. Journal of Molecular Biology 279:833–840. Proceedings Of The National Academy Of Siences Of The United States Of America 78:6840–6844. Proceedings of the National Academy of Sciences of the United States of America 71:4135–4139. Nature Reviews Molecular Cell Biology 11:579–592. Nature Structural & Molecular Biology 16:589–597. Proceedings of the National Academy of Sciences of the United States of America 96:5452–5457. Trends in Biochemical Sciences 38:507–514. Journal of Molecular Biology 249:126–137. Proceedings of the National Academy of Sciences of the United States of America 88:9513–9517. Proceedings of the National Academy of Sciences of the United States of America 109:17978–17982. Nature Reviews Molecular Cell Biology 3:555–565. Experimental Biology and Medicine 228:111–133. Reviews Of Modern Physics 48:571–585. Journal of Molecular Biology 263:657–670. In: SK Calderwood, editors. Cell stress proteins. New York, NY: Springer. pp. 209–227. Topics in Current Chemistry 328:99–153. Thank you for sending your work entitled “Hsp70 chaperones as non-equilibrium machines: ultra-affinity from energy consumption” for consideration at eLife. Your article has been favorably evaluated by a Senior editor, a Guest Editor (Arup Chakraborty), and 2 peer reviewers. The Guest Editor and the reviewers discussed their comments before we reached this decision, and the Guest Editor has assembled the following comments to help you prepare a revised submission. Both reviewers and the Guest Editor found the paper to contain a number of interesting points, and it is an important topic being explored by others in the biophysics community. However, the reviewers raised some important points that need to be addressed in a revision. These do not require new analyses, but rather providing a clear articulation of some of the calculations, and justifying the assumptions and claims made in the paper. The reviews of the two reviewers are provided below in their entirety. Please address each of the itemized points in the resubmission, and briefly indicate how they have been addressed. In their paper “Hsp70 chaperones as non-equilibrium machines: ultra-affinity from energy consumption”, De los Rios and Berducci address an interesting problem. What is the purpose of energy consumption in the Hsp70 protein system? The authors argue that energy consumption can increase the binding affinity of heat shock proteins for their substrates. The work is potentially interesting, and I think very clearly presented. However, in my opinion, it is not the rigorous theoretical study I would expect of a theoretical paper in a leading journal. In particular, it is unclear in what kinetic regimes their mechanism works in and how general it is beyond the parameters used to model the Hsp70 system. Energy consumption has become an important topic of research in a variety of settings: for understanding adaptation in cells (see recent paper by Tu group in Nature Physics), sensing external concentrations (see work by Mehta and Schwab PNAS and ten Wolde group PRL 2012), and genetic switches (see paper by Qian group PRL 2005). More generally, the Qian and collaborators have developed a simple framework for understanding non-equilibrium thermodynamics for an open chemical system that is imported in this study. The Hsp70 system is a special case of a four-state futile cycle analyzed in many works by Qian and has been generalized to stochastic settings where reactants occur is small numbers in many of the papers cited above. Thus, technically the work is straight forward, if simple, application of what are now somewhat standard techniques in this emerging field. Nonetheless, I think the paper has a potentially interesting insight about non-equilibrium binding affinities. For this reason, I think it is potentially worth publishing. However, I have several misgivings about it in its present form that must be addressed. In particular, it is clear that their scheme relies on a separation of time scales for kinetics of the two states of the Hsp70 protein. However, it is not clear how general this mechanism is? What is the required separation of time scales? Instead of just plugging in parameters from the literature for Hsp70, it would be much more instructive if the authors made phase diagrams as a function of kinetic parameters and showed when there mechanism holds. The same comments hold for what relative concentrations of protein and substrates the mechanism holds for. I really would just like to have a clear idea when the mechanism they describe works. This is the minimum I would expect from a good theory paper. Secondly, the authors rely on ’bulk’ thermodynamics that ignore effects of small protein numbers and substrates. This is probably justified in the Hsp70 system but nonetheless it would be nice to have a brief discussion about this point as it might be important for the applicability of the mechanism to other systems. The authors show that when there are many different reaction pathways that accomplish the same net reaction, the effective dissociation constant of the net reaction, considering all pathways, can be less than the dissociation constant of any individual reaction pathway in isolation -provided there is energy dissipation. They then use this result, termed ’ultra-affinity,’ to understand an experimental observation on HSP chaperones. I found this paper very interesting to read. I have two major concerns. Firstly, I have a concern about the novelty of their theoretical advance (apparent affinity can exceed individual affinities): is ultra-affinity related to kinetic proofreading? This concern does not touch the part of their paper that applies the result to chaperones. Secondly, I have a concern about the correctness of their energy calculations: The authors inappropriately coarse-grained the energy? On this point, I think the calculations can be fixed, if indeed incorrect, without affecting the major conclusions of the manuscript. 1) Question concerning novelty: The authors show that “energy consumption can indeed decrease the dissociation constant ... with respect to an equilibrium scenario.” This phenomenon appears to have similarities to the well-known phenomenon of kinetic proofreading, which involves differential selectivity not explainable by equilibrium affinities. I would find it helpful if the authors would discuss their results in the context of kinetic proofreading, which does not seem to be mentioned in the current manuscript. 3) The result of ultra-affinity seems fundamental – in support of the importance of the paper – but it relies on techniques that have been around for decades (Schnakenberg's paper, Hill's book on Free Energy), so it is tempting to wonder whether it is truly a novel result. In comment 1 above, I asked the authors to discuss kinetic proofreading in more detail. Here, I just want to comment that, in general, a more thorough discussion of the literature on the role of energy in biochemical systems may help to place the theoretical result more solidly as novel, if the authors feel they can do it without pulling focus from their discussion of the chaperone system. 4) I would find it helpful to have some additional detail about the calculations behind Figure 2. It wasn't clear to me which rate constants were varied to vary gamma in Equation 2. (I think it is k_h.) Also, I didn't see how the chaperone concentration entered Equations 2 or 3, and so I didn't understand why the results in Figure 2 depended on the chaperone concentration. I apologize if I missed these details. […] I have several misgivings about it in its present form that must be addressed. In particular, it is clear that their scheme relies on a separation of time scales for kinetics of the two states of the Hsp70 protein. However, it is not clear how general this mechanism is? What is the required separation of time scales? Instead of just plugging in parameters from the literature for Hsp70, it would be much more instructive if the authors made phase diagrams as a function of kinetic parameters and showed when there mechanism holds. The same comments hold for what relative concentrations of protein and substrates the mechanism holds for. I really would just like to have a clear idea when the mechanism they describe works. This is the minimum I would expect from a good theory paper. We thank the reviewer for the suggestion. In the revised version, we analyzed more carefully both the effect of the separation of time scales and the effect of the relative concentrations of chaperones and substrates by means of phase diagrams (Figure 3A and 3B). We believe that this more thorough exploration of the space of parameters, which is not limited to experimental Hsp70 data, addresses the questions raised by the reviewers. A completely exhaustive analysis of a four- state cycle would be beyond the scope of this work that focuses on the Hsp70 system and is aimed to a broad readership. Secondly, the authors rely on “bulk” thermodynamics that ignore effects of small protein numbers and substrates. This is probably justified in the Hsp70 system but nonetheless it would be nice to have a brief discussion about this point as it might be important for the applicability of the mechanism to other systems. The reviewer’s comment is correct and we added a brief discussion about the need of a stochastic description for less abundant proteins at the beginning of the Materials and method sections. 1) The authors show that “energy consumption can indeed decrease the dissociation constant ... with respect to an equilibrium scenario.” This phenomenon appears to have (at least superficial) similarities to the well-known phenomenon of kinetic proofreading, which involves (differential) selectivity not explainable by equilibrium affinities. I would find it helpful if the authors would discuss their results in the context of kinetic proofreading, which does not seem to be mentioned in the current manuscript. We reply here to both point 1 and point 3 (see below) raised by referee 2. We thank the referee for the suggestions. In the revised manuscript we briefly discussed the general relevance of non-equilibrium thermodynamics in functional biochemical cycle and mentioned a few recent theoretical studies about this topic. Particularly, we sketched the major analogies and differences between the kinetic proofreading concept and the ultra-affinity proposed here. We thank the reviewer for their insightful comment. Gamma as defined in our coarse-grained cycle does not straightforwardly correspond to dissipated energy. Therefore for the sake of clarity we used the ratio of the basal hydrolysis rate (kh) and the substrate accelerated one (khS) as key parameter to study the system behavior. Indeed, the latter is the quantity controlled at cellular level by means of substrate/cochaperone interactions. 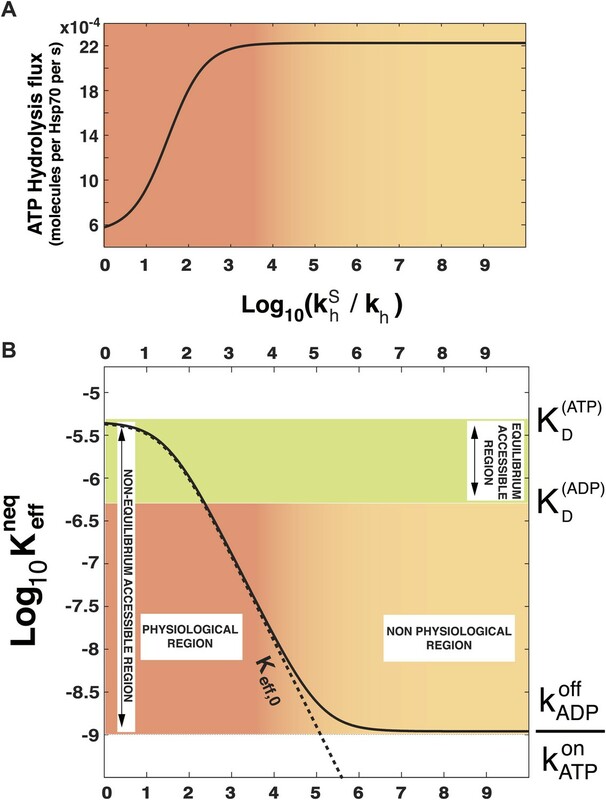 Moreover, the ratio khS/kh is directly related to energy consumption measured as ATP molecules hydrolyzed per second per chaperone (see Figure 2A). Thus, we believe that the new presentation of our results in terms of experimentally measurable quantities makes our work accessible to a broader audience without affecting our main conclusion (i.e. enhanced affinity by means of energy-consumption). Regarding the reviewer’s concern about the possible role of ATP-synthesis rate, we point out that the latter process has been proved to be below the level of detectability implying a molecular rate below 10-6 s-1. We have checked that the consequences of a synthesis process with such a low rate in our scheme are negligible both for the steady-state concentrations and for energy consumption. 3) [… In] general, a more thorough discussion of the literature on the role of energy in biochemical systems may help to place the theoretical result more solidly as novel, if the authors feel they can do it without pulling focus from their discussion of the chaperone system. See reply to point 1. 4) I would find it helpful to have some additional detail about the calculations behind Figure 2. It wasn't clear to me which rate constants were varied to vary gamma in Equation 2. (I think it is k_h.) Also, I didn't see how the chaperone concentration entered Equations 2 or 3, and so I didn't understand why the results in Fig. 2 depended on the chaperone concentration. I apologize if I missed these details. As the reviewer correctly pointed out, we varied gamma by changing khS. In the new version of the manuscript, the central role of khS is obviously even more explicit. The total chaperone concentration enters the calculations by means of its effects on the five mass-balance non-linear coupled equations that solve the system (see Materials and methods). Technically, the first four equations are a linear system that can be solved as a function of the free substrate concentration. An iterative scheme ensured that the latter was consistent with the fifth equation. AB thanks the Swiss National Science Foundation for financial support under the grant PZ00P2_136856. We thank SJ Landry for useful discussions.